This is for anyone who has very little storage in their basement or garage. My basement is small and I needed a solution to store all of my items with some room left over to have a drum set. So, how did I create even more space? I purchase these great wire shelves on wheels. They are 4 feet wide, 18″ deep, and 6 feet 5″ tall. They each have 5 shelves. The solution for me (and maybe you) was to purchase 6 rolling shelves and make 2 rows of 3 shelves side by side. I have a total of 6 rolling shelves and they are all close to each other. The shelves facing the front have the items that I use the most (pictures, seasonal items, kitchen supplies, household supplies). The second row of shelves have items I use not as often (luggage, humidifier, heaters, sleeping bags, donation items). The third row of shelves store items that I use one time a year(Christmas) or not at all because they are a family inheritance that I am saving for my children. 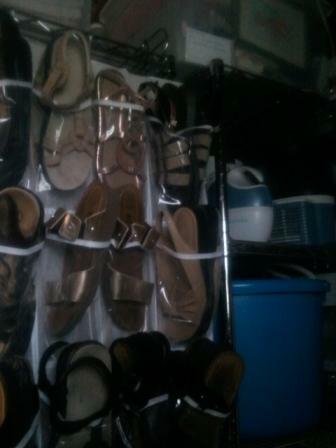 I managed to take advantage of the ends of the shelves by adding a shoe storage holder. Under the front shelves I have my wrapping paper supplies stored in under the bed boxes. These slip really easy under the rolling shelves. When I need to get to the second or third row I just pull the front shelves out-of-the-way. They hold a lot of weight and items and the wheels make them easy to roll. 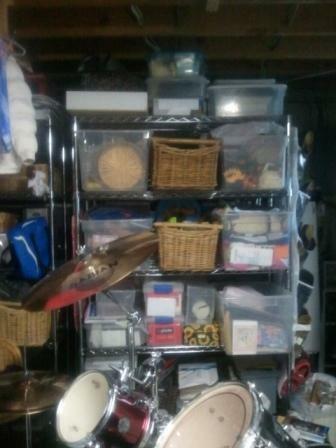 For me, it has created the storage space that I needed and allowed me to have a drum set. Often times, our stuff gets in the way to deter us from having something that we really could enjoy. Why not evaluate your stuff today or call us to help you make space for the things you really want to enjoy? 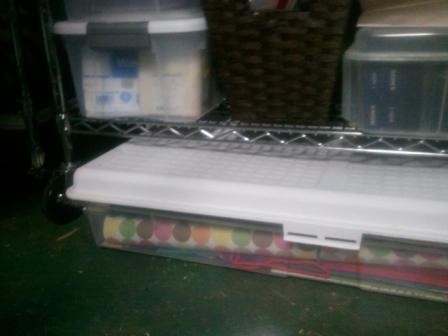 This entry was posted in Residential Organizing and tagged DIY, Organizing Storage Room, Shelves, Storage, Storage Room. Bookmark the permalink.